This page explains the 100 X's (or 100 points) grading system. It also gives you the steps you can use to figure out your own grade. What are the basics of grading for the semester? The overall grading is based on a simple point system. For attendance and for your weekly papers and drafts, each "X" you receive is worth one point. There are 100 X's or 100 points (1 X is the same as 1 point) for attendance and writing. Then your participation and improvement grade may add or subtract points, depending on how much you have participated and improved. For a better understanding of this, please examine the chart below. It explains the three major activities you must complete to get a grade in the course, and what you much do for each activity to get the grade you want. You must satisfy all three of these requirements! (1) Earn 70+ points for a C (or 60+ points for a D) out of 100+ points total. See "Table of Grades" below for more details. Earning extra credit also is possible. Warning: The more you procrastinate, the less chance you will have to earn a sufficient number of points to pass. you to move on to the next higher composition class (Eng 1111 or Eng 1114). Warning: Even if you have enough points for a higher grade, you cannot get it unless you also have the minimum number of Drafts. AND (3) Attend regularly and turn in assignments. Weekly attendance and completion of homework is a must to do well in this class. Warning: If you miss two weeks in a row, you will receive an automatic "F" in the class (which you may then ask to have changed to a "W" or "Withdraw"). What is my grade? - How do I figure it out? This portion of your grade will be determined by how many of your weekly, rough-draft, non-graded assignments you turn in. You will get X's rather than letter grades once your work is sufficiently completed. The total point value is high--100 points/X's or half of your total grade--partly because this is a course in learning how to write better, and partly because there are no graded papers. Instead of graded papers, there are X's for a series of rough drafts in four stages: Draft 1, Draft 2, Draft 3, and Draft 4. There are several of each of these. See "HOMEWORK/Weekly Papers" for more details. For more details, also see the chart of assignments and the X's they are worth: this chart is in your "Course Packet" you must buy from the bookstore for this course. The chart there shows you how all 100 X's/points are distributed. Attendance is very important. Why? Most of the course will not be lecture (and when it is, I'll try to offer something not in the textbooks, or bring together parts of the textbooks in ways the books themselves do not). Instead, the course will have more of a practical workshop format: you'll actually be doing something much of the time--writing or practicing writing as a class, in small groups, or individually. Everything in class is designed to draw together the writing and homework for the course, so it's important to be there every time (or do significant makeup work--see below). You need to attend every time. For each full attendance day, you'll receive one X (1 point). If the course has bulletin boards, then this all includes bulletin board attendance, too--the bulletin boards are part of attendance, not homework. You get only half credit for attendance if you are 10 min. late/early, or if you are late/early for even five or ten minutes on a regular basis. Some days may only be worth 1/2 credit later in the term, in the last half of the course. If so, they'll be marked as 1/2-credit classes. If you miss 2+ wks., you can automatically get an F for the entire course. It is a school policy that instructors may automatically flunk a student who does not attend class for two weeks or more. I carry out this policy in my classes because I have found that people who do nothing for over two weeks, not even contact me, almost never pass the class when given an additional chance, and they also take up about twice as much of my time as an average student, thus keeping me from spending enough time with other students who are doing the work. So, if you run into a problem, please get in contact with me immediately and do attend before your two week period is over. School must come first, like a professional job; if something so overwhelming happens that you need time off, then you should withdraw from your classes (or choose one or more of them to drop). Call or email me if you're not sure what to do, and I'll be glad to help you decide in a balanced way. I, myself, have withdrawn from one or two classes in my own college years. (If I drop you during the first two-thirds of the term - or you decide to drop - then you should apply for a "W" ("Withdraw"). A "W" does not count against your GPA. (But it does count against your fail-to-finish rate.) However, to get the "W," apply for it during the first two-thirds of the course. Otherwise you may be too late, you will receive an "F," and the "F" will be counted as part of your GPA. It is possible to do make-up work for missing attendance, and to also to get extra credit (extra X's or points) in the same way - by doing additional attendance make-up work. In this way, you actually can increase the number of total points you earn for the semester. For a list of all the different types of make-up/extra-credit work available, see the Web page "ATTENDANCE/Make Up and Extra Credit." (f) demonstrate significant attention to and good attitude about learning--not just to me but also to others in our class. (g) have a poor turn-in rate for your weekly papers. You may figure how well you are doing in reaching the grade you want simply by adding up your points. Recommendation: Try figuring two times--once for how many points you actually have, and once for how many points you expect to get. STEP A: Add your attendance points (using the attendance chart passed around at each class). STEP B: Add your weekly-papers points (using the weekly-papers chart passed around regularly). STEP C: Add "A" and "B" above so you have a total. STEP D: Add or subtract points for improvement and participation. To do so, look at the two lists above--the "Positive" and the "Negative." For each positive, give yourself an extra point. For each negative, subtract a point. If you fall between positive and negative for a given quality or action, then do not add or subtract anything for it. When you are done, simply see where your total fits into this scale. Another helpful hint: Plan what grade you will earn. Develop a reasonable, rational goal. Be honest with yourself and ask yourself what grade you can actually achieve, given how much time you can put into the course and how much work you would actually like to do. For example, if your goal is simply to pass the class, then you should aim for a "C"--70-79 points/X's. If, however, your goal is to get a full A, then you need to plan on earning 90-100 points/X's. (1) Using the X's System Is Easy: Previous students rave about this grading system. It is as simple as it is unusual: you earn X's for the grade you want. 90-100 X's = an A for the course, 80-89 X's = B, etc. There are no letter grades on assignments during the course - just X's. In this way, you clearly and cae how you are doing and get what you earn. 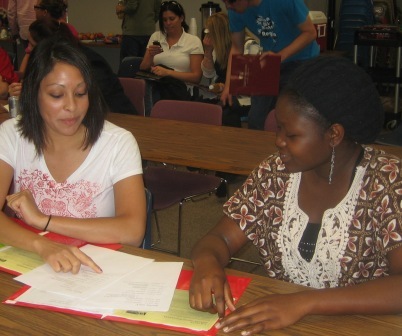 (2) IHCC Academic Progress Policy: As of summer 2007, all Inver Hills students must maintain a 67% completion rate for all credits attempted. This is in addition to the existing requirement that students earn a cumulative Grade Point Average of 2.0 or above. You can drop a class in the first week, and this does not affect your completion rate. However, if you withdraw after that, fail to finish the course, or take an "I" (Incomplete), this will affect your completion rate and also may affect your eligibility for financial assistance. See College Policies for the complete policy.